The story of a former Goldman Sachs/Merrill Lynch executive taking a $25 million payout from Merrill Lynch (after working there just 3 months) and then deciding to purchase a $37 million apartment in New York has been making the rounds over the last day or so. "Now, former Goldmanite Peter Kraus is getting his $25 million bonus, according to people familiar with the situation, though he has been at Merrill only three months. Kraus left Merrill Friday, shortly after after his rich exit package was triggered by the Merrill sale. In a year when some bankers are being paid with junk, Kraus’s exit payment is a stunner that represents to about 0.1% of Bank of America’s $25 billion capital injection from the U.S. government. Talk about your good timing. Kraus was hired in May–when Merrill Lynch was talking about expansion–but didn’t officially start until September, only a couple of days before Thain hurriedly sold the firm to Bank of America to avoid the bankruptcy-filing fate of rival Lehman Brothers Holdings." Merrill's sale to Bank of America triggered a special bonus clause in Mr. Kraus' contract that forced Merrill to pay him $25 million. Since he technically only worked from September to December 22 for Merrill, that's an hourly pay rate that would make even Gov. Spitzer's former employees blush. Pay packages like this were not uncommon in the past few years, but many will try to draw a straight line between the money the US Government injected in Bank of America and the money that Merrill paid out to Mr. Kraus. Again, it is stunning to consider that 0.1% of our total investment ($25 million of our $25 billion) in Bank of America went to pay for an employee that jumped ship three months after joining the firm. At the very least you'd think that Mr. Kraus would try to keep a low profile for the next few years in an effort to not draw attention to the payout. Investment advisor Carl Spielvogel and his wife Barbaralee Diamonstein-Spielvogel sold their cooperative apartment at 720 Park Avenue, at the corner of 70th Street, for $36.63 million, nearly twice what they paid for it two years ago. The sale of the seventh-floor unit closed December 18, according to property records posted Friday. The buyer was identified as Jill Kraus, wife of Peter Kraus, a former executive vice president at Merrill Lynch who reportedly received a $25 million bonus after working at the firm for three months this year." It's in poor taste at the very least to take $25 million from a firm you worked for for 3 months and then spend $37 million for an apartment when many Americans are struggling to make ends meet. My greater concern is for the health of AllianceBernstein - if the CEO of AllianceBerstein thinks it's a smart time to spend $37 million on Manhattan real estate, then I think you have to question his financial acumen. The markets had nice little rally when no one was watching today. There was practically no trading volume again today because but as I've said before light volume leads to wild swings with little cause. Well, maybe the advance was not without cause. Around 4:30pm the government announced another plan to formally purchase mortgage-backed securities from Fannie, Freddie and Ginnie Mae. Now, I'm sure no one leaked that news out to the market early (hint, hint, wink, wink) but it might have been a reason to drive the markets up 100 points in the last 40 minutes. The timing of this announcement (right before year-end) seems designed to goose prices into the end of the year. Given tomorrow's light volume (few sellers are around) the markets could keep going for at least a day. Was this a GMAC rally? I don't know, I suppose it's possible, but GMAC is a busted business (the company lost $6 billion in 9 months, so our $6 billion investment should buy them 9 mths). Ambani lost $30 billion in the past nine months, more than anyone in the world. Former metals trader survived Russia’s gangster wars but may not withstand collapsing markets and heavy debts of at least $14 billion. Russia’s one-time richest man recently received a $4.5 billion loan from a state-controlled bank in order to keep his 25% stake in Norilsk Nickel, which faced a margin call by Western banks from which he had borrowed. Spain’s short-lived real estate gold rush left one of its most visible speculators holding a nearly empty bag. Portillo–who acquired real estate firm Inmocaral three years ago, then led the takeover of the larger Inmobiliaria Colonial in 2006–personally borrowed a reported $1.4 billion from more than a dozen banks during boom times, using his stock as collateral. So, Mr. Axelrod was out today telling everyone that President-elect Obama's stimulus package will be between $675 bil and $775 bil. I'll give you a moment to digest that number. Okay, so we're going to spend it and everyone will be lined up to get a piece of the pie (there will be no controlling the pork in this proposal). Take a note from Mr. Friedman as he relates the experience of traveling from the Asia to JFK. "On Kau Sai Chau, an island off Hong Kong, I stood on a rocky hilltop overlooking the South China Sea and talked to my wife back in Maryland, static-free, using a friend’s Chinese cellphone. A few hours later, I took off from Hong Kong’s ultramodern airport after riding out there from downtown on a sleek high-speed train — with wireless connectivity that was so good I was able to surf the Web the whole way on my laptop. The next day I went to Penn Station, I took the Acela, America’s sorry excuse for a bullet train, from New York to Washington. Along the way, I tried to use my cellphone to conduct an interview and my conversation was interrupted by three dropped calls within one 15-minute span." That's an embarrasment. How can we compete in a global environment when our kids will inherit a country that has the infrastructure of decaying third world country? So let's be smart with this money - energy, tech infrastructure, education (real education - that challenges our kids and our teachers to be better) - or else. We need to be wary of the many hands that will come begging for a piece of the stimulus (retailers, commercial real estate, developers, etc). If we are not on guard, losing 30% in your 401k is going to look like a walk in the park compared to what the future holds for us. A little warmth tends to keep one off the computer for a little while. However, the winds have returned, the Cowboys were humiliated and the temperature has plummeted again, so let's get back to the markets. One of the first indicators of the retail environment this holiday shopping season is the Mastercard spendingpulse which tracks spending by US consumers using their Mastercards. The headline data was sufficiently dismal - down 4% in December from the previous year - but I think this has to be viewed as a minor win for the retailers. If total retail sales end up within a percent of this number (down 3-5%), I think people would be happy with those results. I think you could argue that people paid for a greater percentage of their purchases with cash this year and that could account for some of the Mastercard spendingpulse decline. "A final burst of spending retailers hoped for last weekend never came. Shopper traffic fell 27% compared with the same time last year, while sales declined 5.3%". Really? Did anyone go to a mall last week? You couldn't find a parking space in NY/NJ or PA. Maybe things were really bad in Montana and Arizona. When you wonder what went wrong in the housing market don't look too far beyond good old fashioned greed. The NY Times has a revealing look at WAMU and their lax lending standards. Did WAMU push the envelope to expand the Community Reinvestment Act? Of course not, they did it because it meant big bonuses for bankers and real estate agents. "Yet even by WaMu’s relaxed standards, one mortgage four years ago raised eyebrows. The borrower was claiming a six-figure income and an unusual profession: mariachi singer. Mr. Parsons could not verify the singer’s income, so he had him photographed in front of his home dressed in his mariachi outfit. The photo went into a WaMu file. Approved." "WaMu pressed sales agents to pump out loans while disregarding borrowers’ incomes and assets, according to former employees. The bank set up what insiders described as a system of dubious legality that enabled real estate agents to collect fees of more than $10,000 for bringing in borrowers, sometimes making the agents more beholden to WaMu than they were to their clients." Hmmm, do you think a real estate agent and banker might put their own interest in front of those of a financially naive borrower? For about $10,000 they might. Holy crowds Batman! I understand that this was the final shopping weekend before Christmas, but I was overwhelmed by the crowds of shoppers flooding into retail stores on Saturday in New Jersey. Now, it should be noted that shopping is something of an Olympic sport in NJ and the winter weather on Friday night probably compressed much of the weekend shopping into one small period on Saturday afternoon, but the amount of foot traffic was out of control on Saturday night. We'll see how the retail numbers turn out in a couple of weeks. Tom Friedman's piece in the NY Times today is worth a read. "With unemployment now soaring across the U.S., said Stephen Roach, the chairman of Morgan Stanley Asia, Americans — “the most over-extended consumer in world history” — can no longer buy so many Chinese exports. We need to save more, invest more, consume less and throw out most of our credit cards to bail ourselves out of this crisis. But as that happens, we need China to take our discarded credit cards and distribute them to its own people so they can buy more of what China produces and more imports from the rest of the world. That’s the only way Beijing can sustain the minimum 8 percent growth it needs to maintain the political bargain between China’s leaders and led — not to mention pick up some of the slack in the global economy from America’s slowdown. However, if I’ve learned one thing here, it’s just how hard doing that will be. China’s whole system and culture nourish saving, not spending." "Moreover, China can’t just shift production from the U.S. market to its own consumers. Not many Chinese villagers want to buy $400 tennis shoes or Christmas tree ornaments." This is especially important. Most of the goods that China produces are specifically made for the US consumer and have very little global appeal. Bailout on Quadruple Witching = Rally. The markets have rallied about 10 times on the rumor of an auto bailout. The automakers finally got their 2 mth lifeline (how much better will business be in March?) and the timing couldn't be better. There are massive amounts of options expiring today and those options drive the market today (it's fairly complex, but expect lots of weird swings as people push the market up to devalue puts - to buy them back - and then sell the market down to devalue calls - to buy them back). Another crazy variable that market watchers need to keep an eye on is the weather. Many traders might try to beat the weather out of NY and Boston today. That could create some interesting action at the end of the day. Do you think I could park an oil tanker in Clayton for a couple of years? My vision for the oil market has been that oil will rebound when the US dollar falls. Well, the US dollar is stumbling like a bond trader out his last Wall Street Christmas party, but oil can't find a bottom - it traded $36/barrel today (down from $147 this summer). So, has demand fallen 75%? Of course not. Demand is down some, and it's likely to fall some more in the near future, but there seem to be other things influencing the price of oil. 1) OPEC cut - Everyone expected a historic cut to save the day and push prices higher. When everyone expects something to happen, there's a pretty chance that you should take the other side of that bet (it's how Vegas makes money of you). After the historic OPEC production cuts everyone waited for a rally that never came. 2) Everyone is an Energy Trader - In 2006 - 2007 everyone was trading heavily in commodities (including oil). The popularity of oil as an asset class has plunged along with it's price. Many new energy investors (hedge funds, pensions, John The Barber) are blowing out positions so that they don't have look foolish on their year end statements. In simple, supply/demand terms, there are a lot more sellers of oil, than buyers. Again, the plunge of the US dollar should eventually push oil back up sharply, but let's enjoy $1.50 gas while we can. We might never see it again. GE is the bluest of the blue chips in the US and today S&P put their debt on a "negative" creditwatch. The implications of this are widespread. There is no greater proxy for the global economy than GE. In essence, S&P put the global economy on negative creditwatch. This dovetails with yesterday's news that leading economic indicators are still falling. Despite all of the cheerleaders on TV telling us that the sun'll come out tomorrow, there is an awful lot of bad news still hitting the tape. "The ratings agency said Wednesday that the outlook revision reflects, in part, concerns relating to GE Capital's "future performance and funding." S&P credit analyst Robert Schulz wrote in a research report that, "In addition, fundamentals-based earnings and cash flow could decline sufficiently during the next two years to warrant a downgrade." 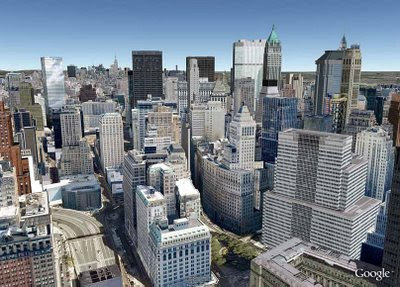 Google Earth has gone through the painstaking process of turning 1,000's of two dimensional images into a 3D rendering of Manhattan. I guess it's sort of cool, but it feels a little Google is going NASA on us. Yes, we know tang tastes good. Do we need to test to see if it tastes good in space? Any guess on what business model could be based on this type of rendering? Video games? Virtual travel (the joys of NYC without all the pigeons and annoying tourists)? Calpers (the California public employee pension) managed to lose more than 100% on their most recent investments in real estate. In order to lose more than you invested you have to be either really stupid or willing to take on way too much risk (or both). In this case, it appears Calpers was both. 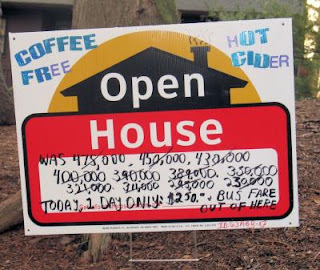 They apparently borrowed billions to buy up overvalued California real estate. City and county officials are going to be left scrambling to make up the shortfall via ....... wait for it ......... new taxes! "At the height of the property bubble, California's giant pension fund, Calpers, made a fateful decision: It aggressively poured money into real estate. As a result, today it's one of the biggest owners of undeveloped residential land in America. Calpers has lost almost a quarter of its assets since July 1, the start of the current fiscal year. Calpers is now warning California's cities, towns and schools that they may have to cough up more money to cover the retirement and other benefits the fund provides for 1.6 million state workers. Some towns are already cutting municipal services, and at least one is partly blaming the Calpers fees. Calpers in recent weeks said it expects to report paper losses of 103% on its residential investments in the fiscal year ended June 30. That's because Calpers invested not only its own money, but billions of dollars of borrowed money that must be repaid even if the investment fails. In some deals, as much as 80% of the money invested by Calpers was borrowed." It is worth watching how NYS public pension performance. Can Big Ben Turn the Credit Crisis into a Currency Crisis? I think this is the big question facing us today. So far, the world, US pensions, and US investors have been happy to lend to the US government at alarmingly low rates. However, the latest moves by the Federal Reserve seem to indicate that we are tipping into dangerous territory and I suspect that many investors are beginning to question our nation's ability to repay or refinance our obligations. The Fed’s debt purchases will cause the dollar to weaken to $1.4860 per euro, analysts led by Robert Sinche, New York-based head of global currency strategy at Bank of America Corp., wrote in a report yesterday. The Fed reduced the scarcity of dollars and investors slowed the deleveraging process, which drove the currency to a 2 1/2-year high against the euro in October, Sinche said. While there are some benefits to a weaker US dollar (Canadian tourists, improved exports), I sense that this may be the beginning of a global shift away from the US dollar as the reserve currency of the world. Given our current economic condition any signal that this is the case could cause massive moves in the value of the US dollar. This may result in higher oil/gas prices and higher inflation at a time when we can least afford to fight inflation. Right now I'd only say there is a 20% chance of this sort of rapid devaluation occurring but it is worth monitoring in 2009. How Bad Are Things When You Stop Paying Insurance? I was stunned by this article that shows the number of uninsured drivers is on the rise. I'm not sure if I'm surprised by the fact that people have cancelled their insurance, but perhaps I'm more surprised by the statistics on the number of uninsured drivers on the road. "I am seeing a lot more canceled policies than ever, especially in the last couple of months, usually due to job loss," said Christine Williams, a licensed agent at Insurance.com's call center outside Cleveland. The trend is bad news for everybody on the road. If you're hit by an uninsured motorist, you may have to sue to recover costs, and many uninsured motorists have few assets. You can protect yourself by carrying uninsured-motorist coverage -- almost half of states require the added coverage -- but this may boost your premium. Even in good times, many Americans drive without insurance. The Insurance Research Council's previous study, released in 2006, found that nearly 15% of drivers nationally were uninsured in 2004, up from about 13% in 1999. In some states, including Mississippi, California and Arizona, roughly a quarter of drivers weren't insured." Up to a quarter of all drivers in California or Arizona may not have insurance? How is that possible? This seems like there should be an easy fix to this problem - have insurance companies merge their data with state DMVs, if someone cancels insurance and doesn't renew they get a letter from the state asking them to surrender their plates. If the plates aren't surrendered, the police could take a break from ticketing people* to pay a visit to the car's owner and seize the plates. Uninsured motorists cost all of us money and taking them off the road is a good first step toward putting more $$$ in your pocket (well, in reality, the insurance companies would keep 99% of the savings and cut your rates by $0.82/year). * I'm thankful for the many hardworking police that protect and serve. However, I think it is clear to anyone that has driven in NYS recently that the current budget crunch has law enforcement looking to pad budgets with a year-end ticket blitz. Remember to use that handy little cruise control button even on short trips into town. Today's rally was a little stronger than I think many (myself included) anticipated. There were a number of very strange option trades today that usually are paired with stock trades. Those trades represented a fair amount of volume in the market today and there were rumors that they were tied to the unwinding of the Bernie Madoff ponzi scheme. If you had to unwind a big stock position (to repay investors) doing in on a day that the market is up would be the ideal circumstances. Chief Financial Officers (CFOs) are the guys that write the checks inside corporate America. CFO's tend to be more realistic in their vision than their CEO's that tend to wear rose colored glasses. Duke University conducts a survey of 1,200+ CFOs quarterly to gauge spending plans, hiring plans and their expectations for growth. This quarter's results were startling. -- Nearly 60 percent of CFOs say the U.S. economic recovery will be delayed until the fourth quarter of 2009 or later, while 71 percent of European CFOs expect Europe’s recovery to be delayed until at least the fourth quarter of 2009. -- Employment is expected to fall by 5 percent in the U.S. and Europe in 2009, and by 0.5 percent in Asia. Capital spending is expected to fall by about 10 percent in all regions. -- Weak consumer demand and financial market woes are major concerns for CFOs around the world. More than 70 percent of U.S. and European firms are concerned about the state of their financial institutions. Among users of financial derivatives, 75 percent are concerned about the risk of default. European and Asian CFOs are also worried about currency volatility. "The Federal Reserve slashed its target interest rate to a range just above zero and promised to march ahead with unconventional measures to combat a recession that has deepened in the past few weeks." They clearly are seeing the same evidence that I see, that the economy has fallen off a cliff in November and December. So because the news is so dire, stocks exploded on the news up over 300 pts. The markets are now closing back in on that 9,000 level that we've bumped up against a couple of times. Maybe a good car bailout rumor could push the markets up to new highs just before Xmas. I think there is increasing evidence that the S&P 500 companies may earn as little as $50/share next year. With an average multiple of 8-10 times earnings, I can see an another ugly scenario for 2009. And the stock is going to be up 10% at the open. Goldman Sachs saw their net income fall from a $10+ billion profit in 2007 to a $2 billion loss in 2008. And their stock is going to be up 3-5% at the open. The markets still want to wind a little higher and there are still thousands of traders that hang on the old "Fed cuts rates, we must rally" mantra. Today should be relatively uneventful until the Fed announcement comes out at 2:15. Keep in mind however, that the Fed has slashed rates all year and it has done practically nothing to improve the economy. One parts supplier said today that they expect 2009 US auto sales of 9.3 million units. That's the lowest estimate that I have seen to date. Again, the auto industry in the US is built on the assumption that all car makers (foreign and domestic) will sell 14 to 16 million units annually. The cost structure of the industry makes it very hard to operate if the industry sells just 9.3 million units. Some supply will have to go away in order to improve the health of the industry if these forecasts prove to be correct. 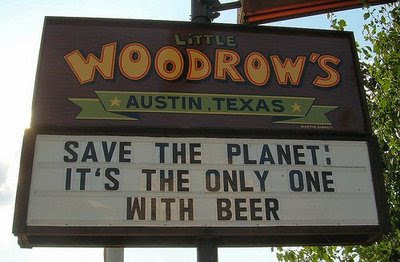 A business parable.... I find this sadly accurate, but hysterical at the same time. A Japanese company and an American company decided to have a canoe race on the St. Lawrence River. Both teams practiced long and hard to reach their peak performance before the race. Feeling a deeper study was in order, the American management hired a consulting company and paid them a large amount of money for a second opinion. Humiliated, the American management laid off the rower for poor performance, halted development of a new canoe, sold the paddles, and canceled all capital investments for new equipment. The money saved was distributed to the Senior Executives as bonuses and the next year’s racing team was out-sourced to India. The markets seem to be reacting to the news that the US is going to tap the TARP to provide immediate liquidity to the car makers. This is likely to get the Big 3 through January, but I can't imagine a scenario under which the business prospects improve for the Big 3 by the end of January. In fact, I think you can argue that the auto industry might be in worse shape come January. This feels very much like a punt from one President to a President-elect. The markets seem to love this idea, but I'll reiterate that business throughout the US - Retail, Pharma, Tech, Software, etc - continues to weaken by the day. The big short funds are licking their chops. Jim Rogers is one of the smartest investors of our time. I think my style is very similar to his - we occasionally get the timing wrong, but the trends or themes we identify usually turn out to be right. That being said Mr. Rogers has been way wrong on China over the last year. Mr. Rogers made some waves over the weekend when he claimed that most major US banks are essentially bankrupt.
" Jim Rogers, one of the world's most prominent international investors, on Thursday called most of the largest U.S. banks "totally bankrupt," and said government efforts to fix the sector are wrongheaded. 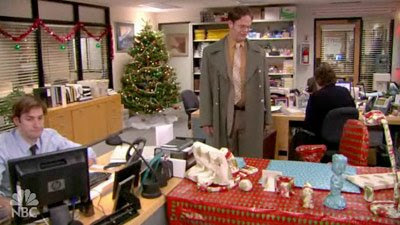 Thank you to the writers of The Office for the opening scene this week. For anyone that didn't see the episode, look for it on NBC.com. It's gold, Jerry, gold. Goldman Sachs made a fairly bold call today regarding the financial status of various states. For those that don't know - Governor Corzine of NJ is the former CEO of Goldman Sachs. So when Goldman today essentially recommended shorting the debt of various states (CA, NJ, FL, OH, MI and others) you can imagine the pleasantries that were exchange across the Hudson River. Since apparently every Governor in the US is now subject to wire tap - I'm sure tape of this call will surface soon enough. "Goldman Sachs Group Inc., one of the top five U.S. municipal bond underwriters, is angering politicians and public-finance officials in New Jersey, Wisconsin, California and Florida by recommending that investors purchase credit-default swaps to bet against 11 states’ debt. Credit-default swaps, conceived to protect bondholders against default, pay a buyer face value in exchange for the underlying securities or the cash equivalent should an issuer fail to adhere to debt agreements. They increase in value as perceptions of credit quality deteriorate. Goldman recommended buying credit-default swaps on “a basket of liquid State General Obligation credits with current and worsening fiscal outlooks,” including California, Florida, Nevada, Ohio, Wisconsin and Michigan. The practice of betting against such states is “distasteful,” said Frank Hoadley, Wisconsin’s director of capital finance in Madison." I tend to agree that it's in poor taste to bet against a state, but finance is finance. Some of the states with trouble are easy to see - FL, CA, OH, MI - but it's painful to watch NJ, CT, MA and Hawaii facing troubles as a result of their pension issues. Remember all those images of people lined up around the block on Black Friday? And all of the stories that highlighted a growth in Black Friday sales? I think we said it was important to wait for the real data to come out before we draw any conclusions. Well, the best data available on Black Friday finally came out today. Sales of consumer electronics (the big ticket items that everyone was chasing on Black Friday) recorded their first ever year over year decline. "U.S. consumer technology* brick and mortar sales experienced the first-ever decline during the week of Black Friday. Revenue was down more than 8 percent from November 23 through November 29, 2008 compared to the same time period last year, according to NPD’s weekly tracking service". According to NPD consumer tech sales actually fell below the level of 2006. Sometimes the breathless race to report a story causes the media to lose sight of the truth. Finally, when you need a little inspiration consider the story of the 73 year-old college basketball player.... He rocks. We're not breaking any news since Drudge already linked to this story, but for the first time ever investors are now paying for the right to lend the Government money. You read that right. Lend the US Government $1,000 for three months and at maturity you will receive a plump check for $999.75. Huh? Who in their right mind would do that? Well, it seems that the flight to safety has been taken to an extreme and nothing outside of US Government Debt seems acceptable right now. "Treasuries rose, pushing rates on the three-month bill negative for the first time, as investors gravitate toward the safety of U.S. government debt amid the worst financial crisis since the Great Depression. The Treasury sold $27 billion of three-month bills yesterday at a discount rate of 0.005 percent, the lowest since it starting auctioning the securities in 1929. The U.S. also sold $30 billion of four-week bills today at zero percent for the first time since it began selling the debt in 2001. " So while the stock market has meandered along over the past couple of weeks and sits about 15% above our November lows, the bond market is acting like the world is coming to an end. One of these two markets is going to be right and historically, the smarter money is in the bond market. We'll see how the next couple of weeks play out. * The name is more menacing than the reality - apparently it's a self contained unit for diverting inbound missiles, but all I see when I see the video is that crazy robot that runs wild in Robocop. Thankfully, you can still manage to spend $170+ on a pair of UGG (ly) boots from Australia. 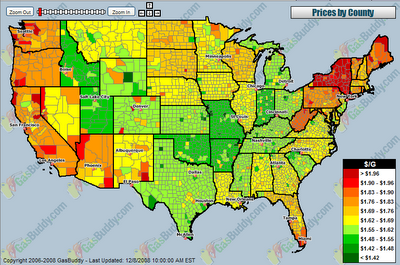 A couple of years ago I posted the gasbuddy gas map that highlights gas prices across the country. Not much has changed, the central part of the US still pays below average because of lower gas taxes but it's still painful to see most of NYS deep in the red (paying the highest state average by a pretty wide margin). "More than half of delinquent homeowners whose mortgages were modified earlier this year ended up redefaulting within six months, a top bank regulator said Monday. Some 53% of borrowers with loans modified in the first three months of 2008 and 51% of those with loans modified in the second quarter could not keep up with payments within six months, according to U.S. Comptroller John Dugan, who spoke at a housing conference. The high redefault rate raises concerns about the long-term effectiveness of loan modifications, which many are pushing as a key solution to the nation's financial crisis." I remain convinced that many, many homeowners continue to walkaway or fall behind because they feel that they are throwing good money after bad as their home values continue to tumble. The markets continue to look the other way as they wound higher on a plan to pave America, save the Auto Industry (for at least a month), and Tribune filing for bankruptcy (anything bad for the Cubs has to be good for stocks!). The news remains startling. Texas Instruments warned tonight on 4th Qtr revenues and earnings. They cut their estimated revenue by 17% and their estimated earnings by 60%!!! I'm not sure that I can emphasize how unbelievable this is. TI isn't some fly by night Internet ad company, this is a major tech company that delivers consistent results. Their business shouldn't swing 60% in a quarter. Oh and Fedex said "significantly weaker macroeconomic conditions are expected to offset the benefits from lower fuel prices and the announced departure of DHL from the U.S. domestic package market" when they cut their earnings forecast by 10 to 25% for next year. We'll see how the market digests this info. Consumerism run amok part 2. This lovely hat can be yours for the low, low price of just $300 at Neiman Marcus. This is an interesting point in the markets. If the markets can break through this level then money will likely chase the markets higher for another 500-1,000 points, but if the markets can't breakthrough then we could retest the lows in short order. Obama Infrastructure Play - I think it's very early to comment on the likely success or failure of President-Elect Obama's infrastructure spending plan. Many engineering, construction and energy stocks are rallying on the prospect of better business as a result of this stimulus. I hate to be a wet blanket, but I think we need only look at a couple of recent large infrastructure builds in the US - The Big Dig in Boston and Rebuilding the World Trade Center come to mind - to realize a couple of things. The cost overruns will be monumental, the pace of work will be painfully slow, and the end results will be mixed. We can't expect to build a new Shanghai, Dubai, or Beijing with our current set of regulations and bureaucracy. Rather than rebuild the crumbling infrastructure in east coast cities, I'd love to see us build a new financial capital on the shores of a northern border river that sits within a 1 hour flight of most major cities and a short drive of all major Canadian cities :) I'll be happy to head up that committee. Another Half Million Out of Work But the Markets LOVE IT! There is an old cliche on Wall Street - "Buy the rumor and sell the news". In essence, this implies that if you hear a rumor of a new iphone, you buy that rumor and sell the stock when the news actually hits the wire. Friday played out in a similar fashion except that the rumor was bad and the news (500k+ jobs lost) was worse, so they bought the market into the close --- totally logical. Sell the rumor, buy the news (when the news is really, really bad) was the mantra on Friday. Interestingly, hidden in the employment survey was the birth/death adjustment that added 30,000 jobs in November - excluding this fictional addition of jobs the report would have looked even worse. The markets have now recovered from the sharp sell-off last Monday and are now positioned for a little rally if they can climb another 5%. From there, the technicians and chart followers will pile in an effort to make up some losses before the end of the year. These moves don't change my fundamental view that the US economy continues to deteriorate (at an alarming rate) and we will trade meaningfully lower at some point in the near future. I haven't talked about oil in some time but it is worth noting that oil is trading at about $41 (up a little now on talk that OPEC is going to cut output). That's $105 BELOW the price in July. Prices at the pump have recently hit a 4 year low. Truly a stunning swing. The reality was that $145 per barrel of oil was way too high (loads of pensions, hedge funds and endowments -- ie, Harvard -- piled into commodities earlier this year) - but $40 is too low. It doesn't mean that oil can't go lower, but the natural price for oil should be somewhere between $60 and $80, but we are not in a natural place right now. The artificial strength of the US dollar has created much of this recent decline, but I expect this to reverse in the next 12 months. When we're paying $3.50/gallon again for gas next year look fondly on the good old days of 2008 when you could buy a gallon of gas for $1.92. In an effort to highlight the lunacy of the US consumer as we countdown to Xmas, I'll try to link to the strangest DEAL OF THE DAY that I see on the web. How about a $120 North Face Hoodie? I haven't spent $120 on all the clothes in my closet - however, that might explain my wife's unease with me in public places (I can still rock my black parachute pants and bolo tie). I've been meaning to post this for awhile. 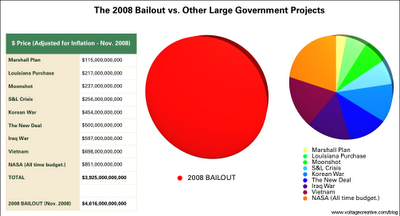 I think you can debate the cost of the bailouts, but it is very interesting to see the prospective cost of this series of bailouts in a historical perspective. The 2008 bailout exceeds the cost of the Marshall Plan, the Louisiana Purchase, the trip to the moon, the S&L crisis, the Korean War, the New Deal, the Iraq War, Vietnam and NASA!! The Best For Sale Sign of the Day! One of the most insane consequences of the credit boom over the past 20 years has been the explosion in the cost of college tuition. Tuition rates have continued to spiral upward because demand has not been tempered rising prices. Why not? Every bump in prices has been met by an increased appetite for borrowing and an increased willingness of lenders to lend. Thus, the cost of college has risen by over 400% in the last 25 years while incomes have risen just 150%. "Over all, the report found, published college tuition and fees increased 439 percent from 1982 to 2007, adjusted for inflation, while median family income rose 147 percent. Student borrowing has more than doubled in the last decade, and students from lower-income families, on average, get smaller grants from the colleges they attend than students from more affluent families. It's going to take a long time to correct this problem, but one of the small benefits from the credit crisis is that it may force cost controls on the colleges and eventually prices may fall. Ideally, our nation's largest corporations will develop their own network of training centers to by-pass the college system entirely (that idea is out there for free - I'm not charging for that one!). In a related story - Harvard's Endowment has been WHACKED this year - Down $8 billion in the last four months! Harvard and Yale have been the poster children of diversification and long-term investing, but they both went very heavy into commodities in the past year - oops! "Harvard University's endowment lost more than $8 billion in four months, a 22 percent plunge that is the steepest decline at the school in modern history. The loss brings the endowment from $36.9 billion on June 30 to roughly $28.7 billion by the end of October. " Mortgage Refi's Save the Day? The markets were directionless for much of the day until people seized on the idea that a surge in mortgage applications last week must mean the end of the housing bust (snark alert). "Mortgage applications filed last week rose a seasonally adjusted 112.1%, compared with the week before, as borrowers rushed to lock in lower rates, according to the Mortgage Bankers Association's weekly survey, released on Wednesday. "Many borrowers missed an opportunity to take advantage when rates dropped sharply for a brief period when the GSEs were placed under conservatorship," said Orawin Velz, associate vice president of economic forecasting for the association. GSEs refer to government-sponsored enterprises Freddie Mac and Fannie Mae. "When rates plummeted following the Fed's announcement that it would buy GSE debt and MBS [mortgage-backed securities], many of those on the sidelines decided to quickly jump in and take advantage of lower rates before they began to rebound." There are so many reasons why this data is bad --- 1) The is week to week data - Millions of people were off last week for the holiday. Applications probably soared in part because people were sitting around. 2) Rates hit a new low last week which inspired many people that were in the application process to cancel existing applications and re-apply for the lower rate. One industry estimate indicated that 80-90% of applications last week were caused by this cancel/re-apply scenario. With that being said, the markets have held up through a ton of very bad data this week. We'll see how the markets weather the retail sales data and jobs report on Friday. "I recently had a client apply for a credit card. She is a homemaker, with no personal income. The house she lives in is in her husband’s name. She would have asked for a $3,000 credit line, just to pay miscellaneous expenses and to establish some credit on her own. So the computer is told that her household income is $150,000; her mortgage/rent payment is zero. The fact is that her husband’s mortgage payment is $7,000 a month (which he got with a no income verification loan). She had a good credit score, but limited credit since she has only lived in this country for the last three years. The system gave her an approval for a $26,000 line of credit!" The markets rallied strongly in the morning despite GE's profit warning on the prospect that GE's financial situation might be stabilizing. But they sold off as the day wore on and then snapped back again in the last hour. The chart readers will look for another close of up 200 points or so to get really excited, but they will be facing some serious headwinds with the data due out later this week (employment survey, etc). Another Weak Month for Auto Sales - Not surprising, but a 37% decline in sales is pretty eye-catching. "Vehicle sales in the United States sank 36.7 percent in November to the lowest rate in 26 years, as the dour economy and tight credit markets made for another lonely month at dealerships around the country. “It feels like we’re back in 1982 right now,” said Bob Carter, a Toyota vice president. General Motors, down 41.3 percent, Ford Motor, down 30.5 percent, and Chrysler, down 47.1 percent, hope the ugly numbers will help them explain their desperation as they ask Congress for $34 billion in government-backed loans to keep them alive." Unfortunately, the US auto industry is built on system designed to support annual demand of 16 million units. Demand right now seems to be at around 10 million units annually. There is no way to close that gap with any amount of cash from Washington (but it expect Washington to try and fix it with money). Imagine if Walmart saw a 38% decline in demand for it's products. Do you think maybe they'd cut costs and close stores or do you think they'd look for a bailout so that they could maintain the status quo until things get better in 2014? "Almost 16 million square feet is currently listed as available in large blocks in 68 office buildings in Manhattan, according to Colliers ABR, a commercial brokerage firm. That is nearly double the space available a year ago." Manhattan operates in a commercial real estate vacuum because of the limited space on the island. However, the tremendous amount of growth in the NYC commercial market in recent years, coupled with the collapse of the financial industry in NYC are going to have a lasting impact on NYC real estate. Perhaps this is the real reason why no one has rebuilt the millions of square feet of real estate at 1 and 2 World Trade Center? "U.S. Treasury Secretary Henry Paulson is debating whether to ask Congress for the second installment of the $700 billion bailout package, concerned about competing demands for the funds and a potentially hostile reaction from lawmakers. Mr. Paulson's dilemma was thrown into relief Tuesday by a report from the Government Accountability Office, the investigative arm of Congress, which sharply criticized the Treasury Department's handling of the Troubled Asset Relief Program, or TARP." Surprise! We Don't Know How We Are Spending the Bailout Money. "The head of a new Congressional panel set up to monitor the gigantic federal bailout says the government still does not seem to have a coherent strategy for easing the financial crisis, despite the billions it has already spent in that effort. Elizabeth Warren, the chairwoman of the oversight panel, said in an interview Monday that the government instead seemed to be lurching from one tactic to the next without clarifying how each step fits into an overall plan." Later on in the article Ms. Warren hits the nail on the head. Banks have slowed lending not because of a lack of capital, but because the creditworthiness of US consumers continues to weaken almost daily. Unfortunately, correcting that problem is not going to be easy. Creating high quality careers in the US economy to replace the thousands of jobs lost in financial, insurance, real estate and pharmaceuticals is going to be the key to a long-term revival of our economy. Throwing away my daughters future tax revenues to keep a couple in their overpriced ranch in Boca is clearly the wrong idea. Oh, well.... It's just money. Take the rest of your 201k cash - go buy a surfboard and a wetsuit!!! 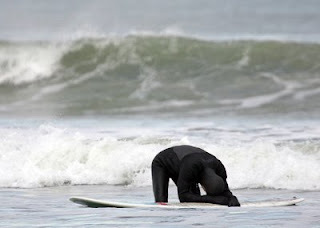 ******Full Disclosure - this was a series of photos taken by a Boston Herald photographer of my younger brother surfing at Nantasket Beach outside of Boston. Surfing in November in Boston!!! That's fantastic. "The best way to double your money is to fold your dollar in half and stick it in your pocket." As I suspected the Thanksgiving week melt-up was met with a healthy dose of reality today. Stocks shed 8-9% in a particularly ugly session as people started to question the Black Friday retail data (sales seemed to be concentrated in low profit discount items) and the poor quality of the sales surveys (they tend to be baised unscientific surveys). Today's drop was the fourth steepest in the history of the markets (three of these drops have occurred since September 2008) and the 12th steepest decline on a percentage basis. The obsession over the daily swings in the markets was unhealthy back in October, but I think the sort of "ostrich with its head in the sand" response is nearly as troubling (anectodal evidence - more and more people keep telling me how they refuse to open their 401k statements). Meredith Whitney - a leading analyst who has been negative on Banks for some time - came out late in the day and highlighted the risk facing banks as the consumers feel the pinch. She said that the drought in consumer credit is likely to be the next shoe to drop in the banking industry. This really contributed to the slide in Financials late in the day. The markets should remain volatile for the foreseeable future as mutual funds and stocks get hit with tax loss selling. However, I expect people to continue to try to trade these swings in an effort to make up for losses earlier in the year. Be nimble if you're in these markets. California is facing a fiscal crisis unlike any we've seen in recent time. Many other states are facing crushing debts and deficits, but the scope of California's troubles makes it extremely important. "Gov. Arnold Schwarzenegger declared a fiscal emergency Monday and called lawmakers into a special session to address California's $11.2 billion deficit. The state's revenue gap is expected to hit $28 billion over the next 19 months without bold action. The emergency declaration authorizes the governor and lawmakers to change the existing budget within 45 days. The state is likely to run out of cash in February. "Without immediate action, our state is headed for a fiscal disaster, and that is why ... I am wasting no time in calling a fiscal emergency special session," Schwarzenegger said in prepared remarks. The Republican governor and Democratic lawmakers have proposed a combination of tax increases and spending cuts, but Republican lawmakers steadfastly refuse to raise taxes." Unfortunately, too many politicians are operating with the mindset that things are normal and they can take a stand on issues like taxes. This is no longer the case. Massive job cuts, true tax hikes and subtle tax hikes (think traffic tickets, more lotteries, sin taxes, etc), have to be enacted immediately or many states, including California are going to be facing some very ugly prospects. There was a good piece in the NY Times today covering the painful reality facing NYC of a weak economy resulting in tax overpayments that now have to be refunded. As most businesses operate they make quarterly payments for the taxes that they estimate they owe on earnings. When business is stable, these tax revenues grow consistently. However, the weakness in the economy led many companies to overpay their taxes and now these companies are requesting refunds at a time when NYC can least afford it. "The refunds — three times the amount typically returned — have triggered deep unease among city budget officials, who are already struggling with weakening revenue and face pressure to slash services and raise taxes. They come as the city, according to the Bloomberg administration, faces a budget shortfall that is expected to climb to $4 billion over the next two years. And having to give back such a large amount of money is certainly going to make the situation even bleaker. Each year, companies estimate their tax liabilities based largely on their performance in prior years. And because the first half of 2007 was so lucrative for many financial firms and other companies in New York, many prepaid millions of dollars more in taxes. But with revenues collapsing this year, companies owe the city much less in taxes. In a departure from previous years, when the companies would simply instruct the city to apply any overpayment to subsequent tax bills, they are demanding the cash now." Unfortunately, this isn't just a NYC issue, this will impact the NY State budgets and tax receipts as well. Thus, the impact will likely be felt throughout the our region as well.